Last month at Comic-Con, the casts of Fantastic Four, X-Men: Apocalypse and Deadpool all assembled in Hall H to take an epic selfie. Shortly thereafter, a rumor surfaced that 20th Century Fox is in the early planning stages for a crossover movie that would bring the X-Men mutants and the Fantastic Four characters together in one movie. Director Bryan Singer even confirmed that "those ideas are in play," as many hoped the studio would confirm this epic movie soon. 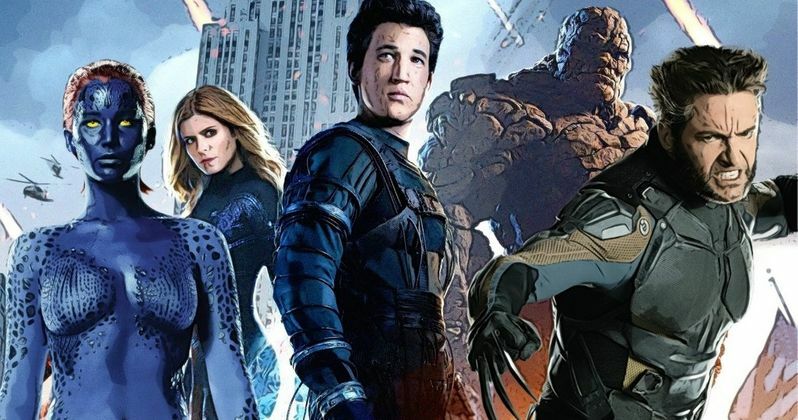 As it turns out, that may not be happening anytime soon, with producers Simon Kinberg and Hutch Parker telling New York Daily News that they don't have any current plans for an X-Men/Fantastic Four Crossover Movie. Did they change their mind after seeing the bad reviews Fantastic Four is getting? Are they hedging their bets against the weekend box office? Are they waiting to see if The Fantastic Four 2 gets canceled? Here's what they had to say in a joint email statement, revealing that both franchises exist in different universes and a crossover probably won't happen. These are close to statements we heard before Bryan Singer confirmed the crossover idea was in play at the studio. "They exist in parallel universes. The Fantastic 4 live in a world without mutants. And the X-Men live in a world without the Fantastic 4. Crossing them over would be challenging, but we sure would love to see all those actors together, the way we had them on stage at (San Diego) Comic-Con." Ever since the Marvel Cinematic Universe started taking off, "shared universes" have become hot commodities at several rival studios. Universal Pictures is putting together a monster movie universe based on their iconic horror movie characters, and Paramount put together a whole team of writers to develop Transformers 5 along with a slew of spinoffs and other sequels. Along with Deadpool, X-Men and Fantastic Four, 20th Century Fox is also developing a Gambit spinoff. It's possible that the studio is simply waiting to see how Fantastic Four performs at the box office before announcing any shared universe or crossover plans. While we'll have to wait a few days for the box office results, the nation's critics certainly haven't responded favorably to Fantastic Four. The superhero reboot has just a 9% rating on Rotten Tomatoes, with only 13 positive reviews out of 138. Then again, the blockbuster Transformers: Age of Extinction went on to earn over $1 billion worldwide with just an 18% rating, so anything is possible. Would you head to the theaters to see the X-Men and Fantastic Four characters collide? Or do you think they should remain separate entities? Be sure to check back throughout the weekend to find out how Fantastic Four fares at the box office during its opening weekend. Chime in with your thoughts on this proposed crossover below.